Luke McCullough has joined League Two new boys Tranmere Rovers on loan until January 2. The 24-year-old Northern Ireland international has found himself down the midfield pecking order since the arrival of new boss Grant McCann. He made a brief substitute appearance at Scunthorpe United in the Carabao Cup last week but was not even on the bench for the first two league games against Southend United and Wycombe Wanderers. McCann has Ben Whiteman and Herbie Kane who can operate in the central midfield role. 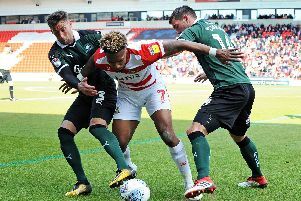 Rovers’ boss said earlier today he hopes to sign another ‘different type’ of midfielder before the August 31 loan deadline - but it won’t be a ‘holding midfielder who doesn’t want to come out of his slot because that’s not the way we play’.